So now the city government is trying to throw her in jail for 30 days. At the same time the city says they do not put people in jail for the camping ban but rather use it to help “connect people to services.” So if they don’t throw people in jail for the survival ban than why are the city prosecutors trying to put Terese in jail for 30 days because of a ticket for the survival ban??? This case will be represented by the renown constitutional lawyer, David Lane, who has recently joined on as co-counsel in the class action lawsuit against the city for the homeless sweeps. If the city gets what they want Terese, a prominent organizer with DHOL fighting the cities injustices, will be in jail for 30 days after this hearing. 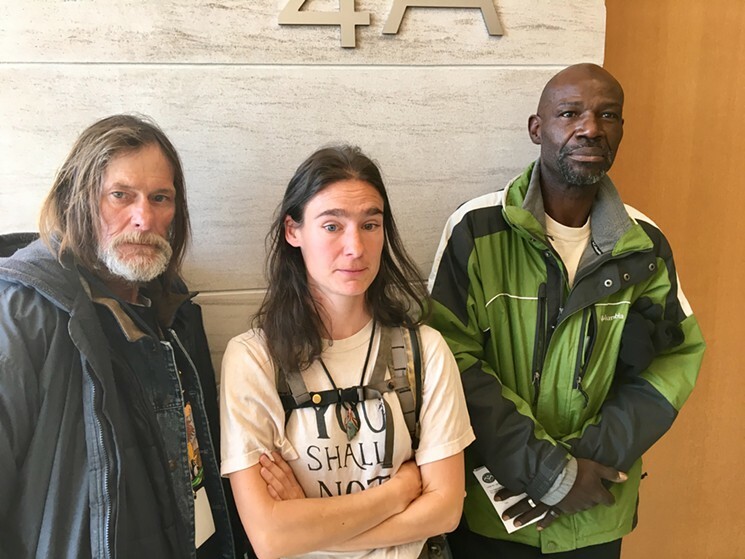 ← EVIDENCE AGAINST DENVER SO STRONG THAT A MOTION FOR SUMMARY JUDGMENT IS FILED IN HOMELESS CLASS ACTION Press Conference and March for our Rights!! This would be easy to avoid if the city of Denver would have a small lot for the winter set up for the “Camping Ban” to avoid court fees and money/time wasted. The Tiny Homes community will help some but there should be a small lot just for the winter in every city just for the winter.